Do you love the short films at the beginning of Disney Pixar films? If you do, then you will want to check out the new Pixar Short Films Collection, Volume 3, available now on DVD, Blu-ray and Digital. This new release also includes 2 mini movies (Marine Life Interviews and Miss Fritter's Racing Skool) plus filmmaker commentaries, making Bao and More! The short, Piper, won an Oscar back in 2016 in the Best Animated Short Film category). When you sit and watch these shorts, you can't help but think about how talented the people who make these and other animated movies and shorts are. The animation and story line are up there, and really move viewers in such a short period of time. I found myself tearing up at the Piper short last year, and then again with the Bao short. 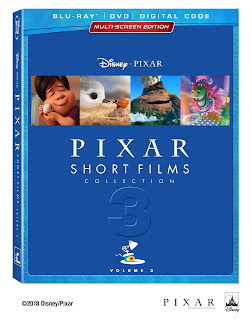 I am so excited to be able to add this new volume to my family's growing Pixar Short Films DVD Collection. And, I have to say that these 16 short films are my favorite so far. You get to watch shorts featuring Cars, Toy Story, Moana, and even Inside Out. I find myself usually sitting my girls to watch Disney Pixar movies just to watch these cute short films before the movie. With the holidays fast approaching this new DVD would make for a great stocking stuffer for fans of Pixar Short Films, or Disney Pixar animated movies in general. And, at only $ , you can't go wrong with the price, for the 16 short films and bonus material.